In 2010, I found myself burnt out by my old career. The stress caused by my gig was so bad that my body began to tear itself apart from the inside in protest of it. I knew that, if I didn’t walk away, I wouldn’t be around for long to regret it. So, walk I did: I took a book deal with Wiley Publications. I updated a Dummies book. My friend Robbie Baldwin gave me a shot blogger to me at MacLife Magazine. For close to a decade, I freelanced. At times, I damn near starved. At others, I wondered how in the hell I had come to be so fortunate. That I worked for myself for so long was due, in equal parts, to there not being a lot of opportunities for full-time employment as a tech journalist in Canada and the fact that I’d had enough of being driven into the ground by a nine-to-five job to last a lifetime. Apparently, a lifetime’s not as long as it used to be. 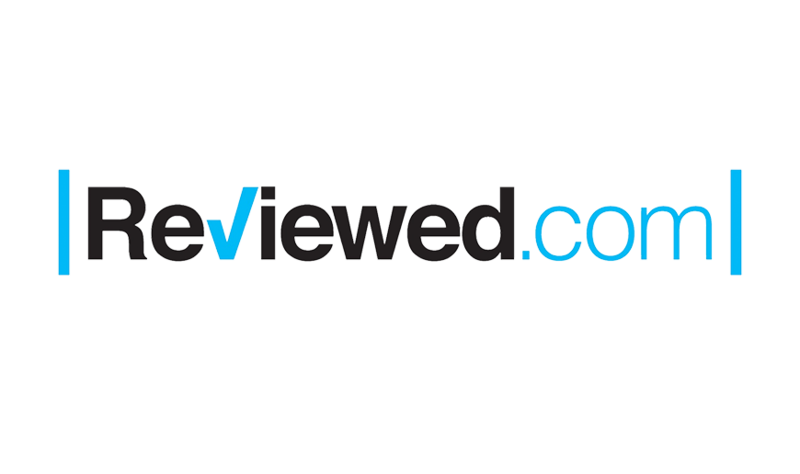 Just shy of two years ago, I started writing for Reviewed.com. I enjoyed the work: they demand an incredible amount of attention to detail: the gear the site reccomends is tested within an inch of being destroyed (and often, in my case, beyond that.) But the tone of the writing is never overbearing. It’s friendly. It’s conversational. scribbling for them feels good. A large part of this is due to the site’s editorial. I tend to shy away from joints that produce drama—if writing for an outlet, with offices that are thousands of miles away from me can cause me stress, I’d rather look for work elsewhere. Life’s too short. I’ve never had a problem with Reviewed’s team. Now, I’m a part of it. A month ago, I accepted a full-time position with Reviewed as the site’s Updates Editor. There’s a lot to learn! But it’s felt great. I have the same boss as I did before and the work feels just as satisfying, if not more so. As a writer, I was able to produce content that had the potential to help my readers make better buying decisions and, perhaps, make it easier to decide if they need to spend any money at all. As an editor, I’m able to continue this same mission on a larger scale, not only producing new content, but also helping to steer a site that I adore towards bigger and better things with a team I couldn’t be happier to be a part of. Also, there are regular paychecks. I’ll still write the odd guide for Reviewed and, from time to time, you’ll see my work in Boing Boing as well. But, for the time being, the long list of new gadgets and tech that I’ve jammed the pages of this site with over the past nine years will be coming to a stumbling crawl. I’ve got spreadsheets to nurture and writers to work with. That said, my evenings and weekends are free, now. For now, the fear not having enough work to pay the bills is gone. I’ve finally got the time to finish writing my damn novel (if the novel wants to be finished,) and for other creative pursuits. As I pull new, original works out of my skull, they’ll be posted to this site’s blog. Hopefully, my demons and travel writing will bring you some enjoyment. They do me. So. That’s that. Time to set to this new chapter. I love e-readers. Given the close quarters that my wife and I live in and the amount of traveling that we do, they’re the best way to maintain an enormous library, without taking up a ton of valuable shelf space. In late 2018, I updated my picks for which kindles do what best, in in the hopes of making buying one a little bit easier for my readers at PC World. You’ll find my review hub, here. If you prefer to travel light like I do, chances are you’ve already got a great piece of carry-on luggage, sized to fit into an airplane’s overhead bin. But when you fly, have you been making good use of the space under the seat in front of you? Most airlines allow travelers to bring one piece of carry-on luggage and a personal item with them. Sure, a plastic shopping bag or purse can carry your snacks, iPad and other sundries when you take to the sky, but the right personal-sized carry-on bag can keep you organized in the air and be a great travel companion at your destination. If you’re interested in buying rechargable batteries to power the doodads and whatzits in your home that still run on AA, AAA, C or D cells, Reviewed.com and I have your back. Head on over and take a look at the results of days of testing. The Nintendo Switch provides an astounding on-the-go gaming experience for the limited amount of time that its battery holds a charge. But after two or three hours, you’ll need to recharge your Switch if you want to keep the digital party going. If you’ve got the console’s charger on hand and happen to be near an electrical outlet, you’re in business. If your Switch dies during your morning commute or anywhere else that plugging in isn’t possible? Game over—unless you happen to have an external battery pack with you. With the sort of stuff that I like to read, I generally lean towards e-readers with a larger display, like the 2017 Amazon Kindle Oasis or Kobo's Aura One. But I love this little thing: the Clara HD was designed by Kobo to go toe-to-toe with the Kindle Paperwhite--and win. Technically, it's a better e-reader in every way. Unfortunately, despite making gains in the area of content, Kobo still can't match Amazon for the sheer volume of reading material available to Kindle users. For my full review of the Clara HD, click here. For around the price of a set of AirPods, you can get a set of Jabra's Elite 65t true wireless headphones. In my opinion, they're a better option, due to their sound quality, adjustable software EQ, weatherproofing and comfortable design. If you're in the market for some truly wireless earphones, I feel that these are likely, for most people, the best all-around pair you can invest in, right now. For my full review, head on over to Macworld. Researching and testing rechargeable batteries is pretty far from exciting, but its one of those projects that I take on, from time to time, that I know will help a whole lot of folks out. Right now, the best rechargeable batteries you can buy are Panasonic's Eneloop Pro batteries. They're pricey, but the amount of power that they'll provide over the years and how rarely you'll have to change them out, compared to other brands makes them more than worthwhile. If you'd like to read a little more about my reasoning on the topic, you can do so, here. It had been many moons since Rick Broida wrote the first version of PC World's How-To on converting PDFs to read on a Kindle e-reader. The methods he outlined in the original haven't changed since Rick wrote them, but are a few options that I felt could use some fleshing out and inclusion into the mix. Given that I've handling all of PC World's e-reader reviews these past few years, updating our tips on how best to use the devices, as well as creating a few new ones, seemed like a natural progression. Expect to see more of this sort of thing in the months to come. To read up on PDF conversion and use with Kindle e-readers, click here. The official Faces of Auschwitz website will be going live, soon. Marina Amaral and the good folks at WordPress have been working hard to ensure that it's ready to go live. Unfortunately, a misadventure with my computer and a number of deadlines have kept me from completing a good chunk of copy the website in a timely manner. I hope to correct that over the next few days. In the meantime, Marina has been hosting the Project's work on her personal website. The story of Gersz Zysking was difficult to write, not because of a glut of terrible details, but due to the fact that little is known about the man, at all. Our goal at Faces of Auschwitz, is to tell the stories of those who were brutally murdered at the hands of Nazi Germany their co-conspirators in KL Auschwitz. The records kept by the camp's administration during the time it was in operation allow us to do this. It is, for me at least, painful work. Viewed through the lens of their concentration camp records, all that can be seen of their lives, in all but the rarest of cases, are the bigotted reasons they were arrested, the hateful way that they were deported from their homes and loosed of their possession and the indignity of their death at the hands of hateful monsters. There is no joy to be found in their eyes; only fear, misery and in a few cases, a flash of defiance. All we have of Gersz Zysking are his date of birth where he was living when he was taken by the Germans, his induction date to KL Auschwitz and the day that his life was ended in the camp. My his rest bring him the peace that he did not have in the end of his life. We lost Anthony Bourdain, yesterday. I decided that I should write about the influence he had on my life. In order to tell this story, I had to give my readers a peek at the dark places I've been, the dogs that have barking inside of my head for decades and talk about my plans for suicide. That I am here writing this today, is due, in no small measure, to Anthony Bourdain. It's not often that I post my work for Boing Boing. They're easily my favourite employer, but for the most part, my time for them is spent reblogging other people's stories. This ain't that. To everyone that I'm close to, who felt that they had a bead on me, I'm sorry that I may not have shared the fact that I've considered, a number of times in the past, taking my life. There is never a good time to talk about such things--an unfortunate fact, given how important speaking on the topic can be. Image courtesy of Marina Amaral & the Auschwitz Memorial Museum. While the Auschwitz Concentration Camp is infamously known for its role in Nazi Germany's plans to eradicate European Jewry, other groups were also tortured and senselessly murdered inside the camp’s walls as well: members of Poland's leadership, intellectuals, clergy and resistance activists, Sinti & Roma, Soviet POWs, Jehovah witnesses and homosexuals. We'll be telling their stories as well. For my part, I'll be serving as an editor on the project. It's my job to create a coherent, readable story out of the material gleaned from the Auschwitz Memorial Archives. It's a passion project for me: I had family murdered in the back of vans in Minsk during the war. Their only crime was that they were Jewish. I volunteered my services to the project in order to honor my family and to ensure that the senseless hatred of the Nazis and their co-conspirators is never forgotten. 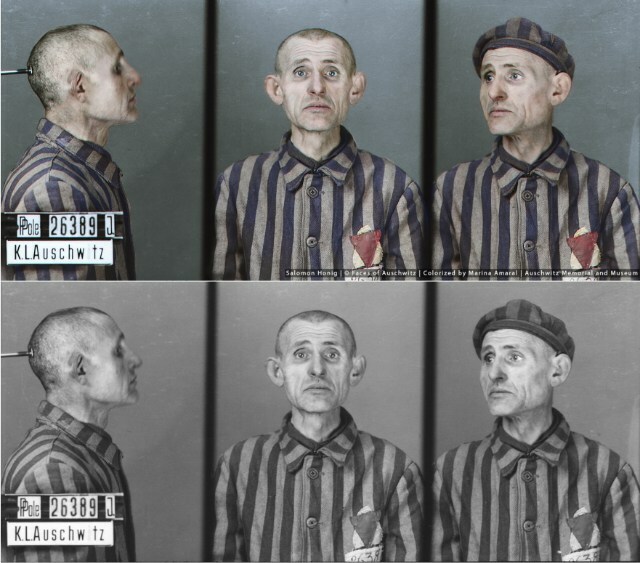 Faces of Auschwitz is a huge undertaking: a dedicated website is in the works, but for now, you can find the first two restored photos and the stories of the people in them on Marina's Website, here. Neither I nor Marina are being paid for our work on the Faces of Auschwitz. We serve the dead that the living might remember them. Earlier today, we were proud to announce that Faces of Auschwitz will be sponsored by the Michael Frank Family Charitable Fund. The Foundation's generous contribution to our work will allow us to expand the scope of the project beyond what we can accomplish with a webpage and on social media: a book, talks surrounding the project, and an educational component are all in the works. I can't think of a greater responsibility or a greater honor than being a part of what we're creating. This is easily the most intimidating and to me, rewarding project that I've been involved in. It's so important that the facts of the victim's lives that I'll be curating be treated with accuracy and dignity. It is the very least that they deserve for the pain and indignities that they suffered at the hands of the German Nazis who ran the camp and their collaborators. As I write this, Marina is no doubt working on a new image to include in the project. As she does so, our colleague, from the Auschwitz Memorial Museum, Pawel Sawicki is likely, in addition to his other duties for the Museum, occupied by selecting which individual from the Museum's archives we should profile next. My contribution to this project pales in comparison to the amount of work that these two do. I'm both happy and honored to have anything to do with them. 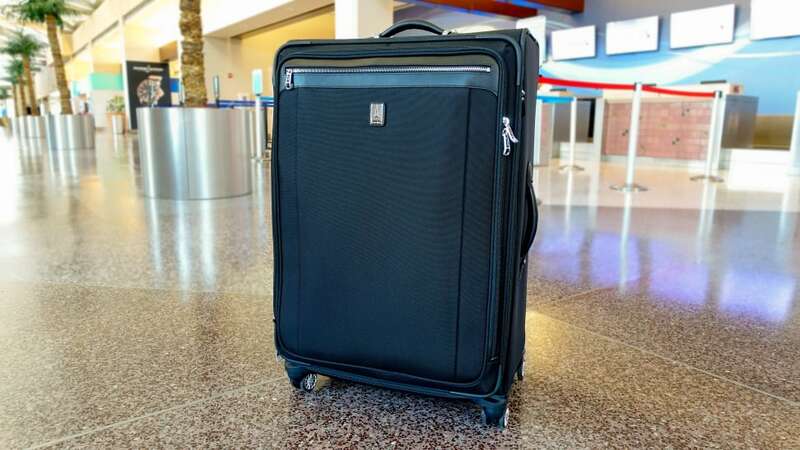 My editors at Reviewed.com worked up a roundup, based on my recommendations for carry on bags and checked luggage, of the five best pieces of luggage to recommend to travelers of all ilks. If you're planning a trip, I've likely got you covered. You can read up on which bags to buy over at USA Today--Reviewed's parent company. I like to travel light whenever possible. After a long flight, being able to grab my bag out of an overhead compartment and leave the airport as quickly as possible feels like such a treat. But not everyone feels the same. Some folks prefer bringing along a gigantic suitcase that can fit weeks' worth of clothing and still have room to spare for hauling vacation booty back home in. Being able to enjoy this kind of packing space, to those who subscribe to using luggage so large that it needs to be stored in a plane's cargo compartment, is worth the miserable wait next to a luggage claim carousel. I recently spend a few weeks researching at testing checked bags to see which ones are worth investing in. If you've got a long journey coming up or just like being able to pack an outfit for every possible scenario, you'll want to check it out. Many moons ago, I researched and wrote about multitools for Thrifter. The resulting feature recently went live on their website. If you need a multitool or want to gift one to someone you care about, you'll want to take a read. It's been a long time since I wrote this guide, but the recommendation is still solid. Having emergency supplies in your home is smart. Keeping a bag in the back of your car or that you can pick up and take with you in the event of a natural or man-made disaster? Even better. Because times are ugly and bad things will happen to good people, I took the time last fall to write about the basics of assembling a bug out bag. Note that I said basics. You'll need to create your personal BOB to suit your needs. After months in a cryogenic sleep, the story is now live on Thrifter. Yep, it's another story for Thrifter that's been frozen in time for the past year. But hey, it's on their website now, so why not take a read of it. Anyone can buy a first aid kit and the kit you get will likely be OK. But the smart money's on creating a medical kit that reflects your level of training--you'll know how to use everything in it and won't find yourself wanting for supplies because you'll be the one that packed the thing. Here's another golden oldie from Thrifter. I wrote it last summer, but it didn't go live on their website until March of this year. In this guide, I discuss the pros and cons of investing in a DSLR camera system or going with a Mirrorless camera setup instead. Hopefully, now that the piece is online, it'll help folks make an informed buying decision before dropping a ton of cash on a new camera. You can read it, here. I wrote this feature for Thrifter last summer. It was just published last month. Given the speed that the camera industry moves at, this guide is most likely woefully out of date. However, the Nikon D3400 is still a solid camera, so not all is lost. If you're interested in learning more, just follow this link. I wrote for Thrifter for a few months last year. It was a strange experience. I was allowed to write about damn near anything I wanted to, with a focus on producing expert-level advice and reviews in a number of consumer technology categories. Every month, I'd submit the stories that I'd cooked up and then, nothing: they'd pay me without my work seeing the light of day. I assumed that they weren't happy with what I was producing, but nope: I was kept on for months. It wasn't until around a month ago, almost a full year after having written some of the pieces that I was paid for, that my work for Thrifter began showing up online. I've since moved on, but you can still grab a peek at my work for the site. 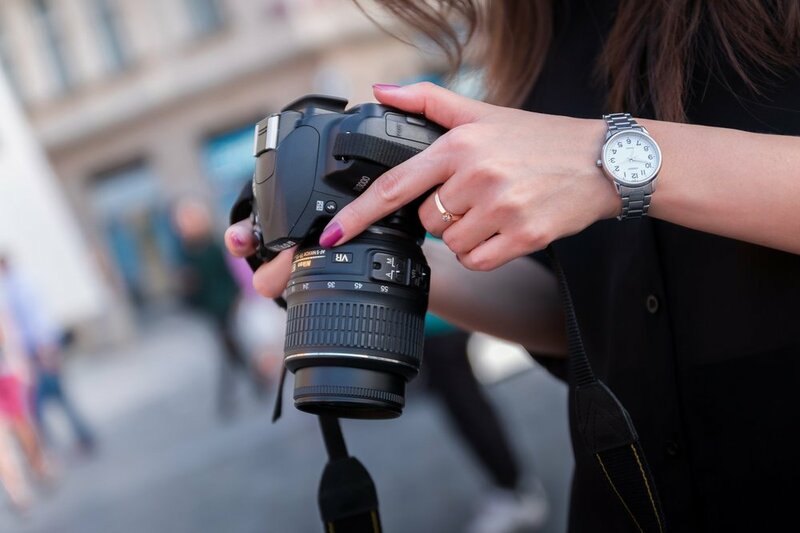 Let's start with this one: a beginner's guide to picking out a decent DSLR lens for your camera, no matter who makes your camera.